We are now offering a free loyalty card for education establishments. 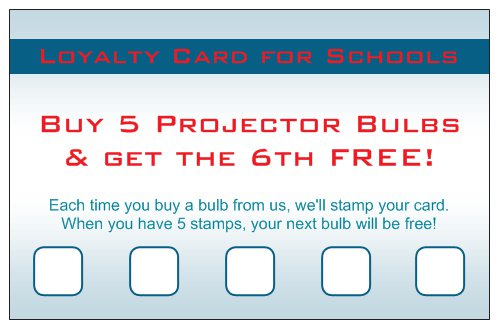 If you buy 5 projector bulbs from us, your next bulb will be FREE! Give us a call on 01462 440044 to find out more. Or, alternatively, use our contact form. Looking for more? Check out our current Offer of the Month, or our latest Education Deals.